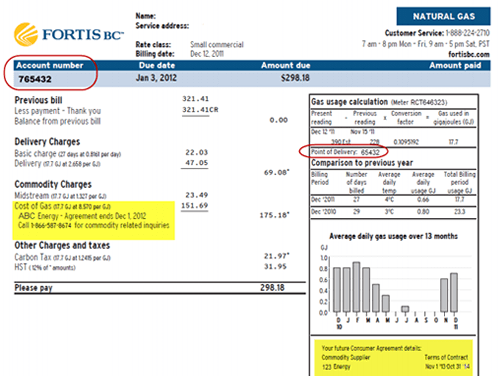 Home > FAQs > Bc > Billing > Billing Information > How do I understand my natural gas bill in British Columbia? How do I understand my natural gas bill in British Columbia? When you sign up with a fixed-rate natural gas plan from Direct Energy in British Columbia, you will still receive that natural gas and your bill from FortisBC. This utility company serves approximately 1.1 million customers in more than 135 communities across British Columbia. They have provided helpful resources to help you understand your natural gas bill. Delivery - The charge to deliver natural gas to your home through the FortisBC pipeline system. This includes the daily basic charge and delivery charge. Commodity - The cost of the natural gas used to operate your gas appliances and heating equipment. In regions where Customer Choice is available, midstream charges are identified separately. Franchise Fee - In some areas, a franchise fee is applied to customers? bills. This 3.09 per cent fee is on monthly charges, excluding tax. A franchise fee is a levy that FortisBC collects on behalf of some municipalities, and allows FortisBC the right to operate within a municipality's roadways. This fee gets passed on to the municipality, city, town or village you live in. When a franchise fee is applicable, the BC Utilities Commission (BCUC) has approved the collection and transfer of this fee.